It looks like Santa Cruz Big Balls 97A, but I can't find this exact logo anywhere on internet. And I would like to know the diameter. 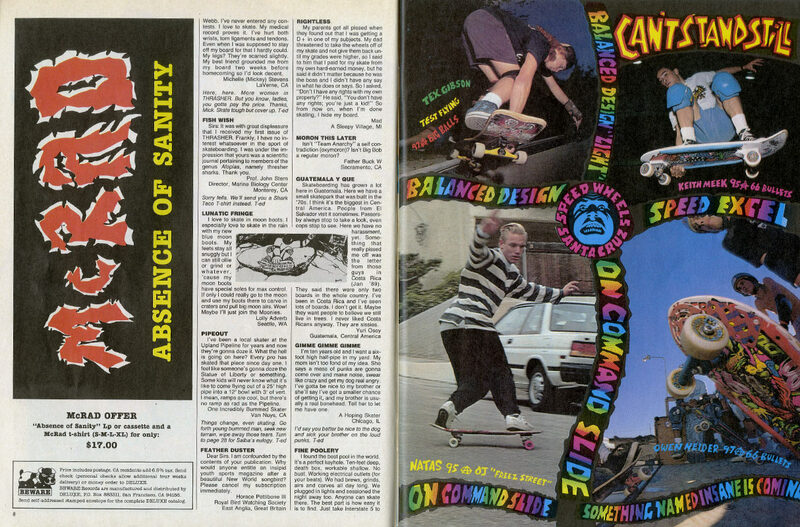 Take a look in the Thrasher Archives to see if there is an ad with that one. I happened to be looking at the April 1989 one and it has an ad listing "Test Flying" for the big balls, so maybe start from May 89 and keep looking until you find it. I saw an ad on Pinterest from 89’ but they looked very similar to Bieb’s Big Balls! Could the posted graphic by any chance be the inner graphic, or do they only have pretty pictures on one side? The other thing is with the text continuing around the bearing, with the underside closest to the bearing, it is more reminiscent of regular Slimeballs, except with the “Slime” bit of “Slimeballs” all scuffed up. The first b is lowercase, and the G uppercase, which just looks weird. This is a wheel of my first real skateboard, bought in Paris probably in december 1989. It was for my christmas. Here is the complete skateboard : H-Street Magnusson mini, Indy 169, Santa Cruz rails. It's the only picture I have.